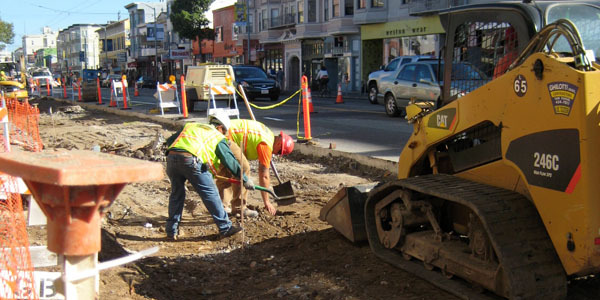 Construction workers work on the Valencia Streetscape project. As early as 7 a.m. the jackhammers begin hacking into the open earth that now lines the businesses on the west side of Valencia Street between 19th and 15th streets. Bulky yellow tractors move to a slow, but steady murmur as they shovel rubble from one spot to the next. Meanwhile, an occasional hammer clinks against cement. It’s not an environment that invites foot traffic, local owners are finding. Yes, they look forward to the transformation the Valencia Streetscape Improvement Project will bring, but in the meantime, business is down and they are using signs, lunch specials, and other means to survive. Jeremiah Capurro, who manages the Mission Bicycle Company located between the 19th and 18th streets on Valencia, said the number of walk-in customers has dropped from 100 to 20-25 since construction began last Wednesday. A few doors down, at Excellent Automotive Services & Repairs, the 20-30 cars being serviced a day has now become 5-10 cars a day. “A lot of people are scared to drive over that narrow ramp,” said Marvin Octaviano, manager of Excellent Automotive, referring to the ramp the Department of Public Works provided as a bridge over the construction. Octaviano has watched potential customers drive back and forth and ultimately give up. Their concern, he said, is justified. “We’ve had a lot of people drive off the ramp already,” he said with a chuckle. Alex Murillo, the public information officer for public works, worked with the contractors to get the ramp built in and was unaware of the situation. There might be restrictions depending on the stage of the construction but he said he would check in with the contractor and engineer in charge. 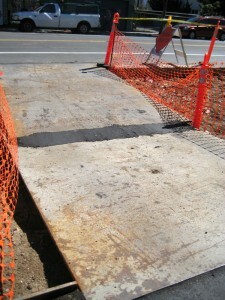 “It shouldn’t be a problem to add an extra steel plate if that’s what they want,” he said. In an attempt to eventually make the Valencia corridor more pedestrian and bicyclist friendly, the streetscape project includes widening the sidewalk from 10 to 15 feet, additional streetlights, and the planting of 80 more trees. While the completion of the entire streetscape project is expected to take nine months, the Department of Public Works asked the contractor, Ghilotti Bros., to work on the west side of the street first. Construction workers will then work their way up to 15th Street, make a U-turn, and then head down the east side of Valencia Street from 15th to 19th street. Despite the city’s efforts to alleviate the burden, businesses have had to find immediate ways to keep business flowing. Excellent Automotive spent $600 on a large white sign that says in bold red letters “Open Drive In,” hoping people will see it and continue to drive through. 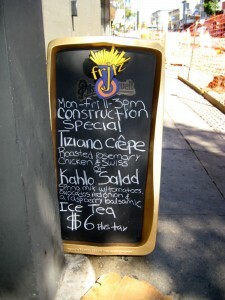 Santiago Rodriguez, owner of Fritz, a Belgian restaurant near the corner of 17th Street, is now featuring the “Loud Construction Special.” He hopes to attract the two-thirds of his customers he lost during lunch hour by offering this $6.00 special which includes a dish plus iced-tea or lemonade. Two blocks down, on the corner of 15th Street, business owner Matt Prentiss is more concerned with construction moving along in a timely manner. “This is not anytime to have your business blocked up by tractors,” said Prentiss, who has been running the motorcycle shop Munroe Motors for more than 20 years. According to Prentiss, construction on Valencia Street has been a “continuous problem” for the last 10 years. When the city took away half of the traffic lanes, eliminated all commercial parking, and put in a bicycle lane, they made it difficult to do business because of the restricted parking. Prentiss points to San Francisco’s five-year moratorium, which only allows construction to happen on a street every five years. This is true, said Murillo. However, the moratorium is block specific. A year and a half ago, the Valencia Street Sewer and Repaving Project repaved the streets between Duboce and 15th, and between 19th and 26th. Those blocks will not get worked on for the next five years. The four blocks that were omitted, 15th through 19th, will now see improvement through the Valencia Streetscape Improvement Project. While Murillo understands that the construction does “get messy,” he asked that merchants be patient. In an effort to continue to meet their concerns, a Holiday Moratorium will bring all construction work to a full stop from Thanksgiving through New Year’s. The contractor will demobilize and remove all equipment from the street to get out of the way of potential holiday sales. “I do see a light at the end of the tunnel,” Rodriguez from Fritz said. He plans to take advantage of the wider sidewalk by putting tables and chairs outside and giving his business more of a bistro-style feel. He says the change will be incredible for the neighborhood. Huh? The change from an extra car-sized lane to a bicycle lane has made Valencia Street a more thriving business area than it ever was before! Enough with this pro-automobile misinformation. Might want to fix the link in this article, especially since it leads to your admin login page. I keep wondering why we’re keeping the bike lanes next to traffic, as opposed to being between parking and sidewalk, especially when there is a major project like this on a major bike thoroughfare. Missed opportunity. I sure hope that restaurants don’t start putting more tables on the new sidewalks. There simply isn’t enough room on busy streets like Valencia. Ever try to walk down 18th in the “gourmet ghetto”? It’s impossible. They should never have allowed these businesses to put seating out there in the first place. This improvement project will do wonders for the neighborhood – it will be great to have wider sidewalks here, outdoor tables, etc. The comment from a reader about outdoor seating on 18th is somewhat misplaced because 18th St sidewalk is very narrow already. There are already tables outside Muddy Waters on Valencia and they’re not a problem. With a wider sidwalk, it should be a lot better. I understand that these merchants are experiencing a bit of a hardship with this construction, but they will greatly benefit from this improvement project — especially the restaurants.